Colors: The Lionhead Rabbits come in many patterns and color varieties. Sixty colors are approved for showing in England! These little rabbits have a mane of wool encircling their head much like a male African Lion. (Both male & female Lionheads have a mane). 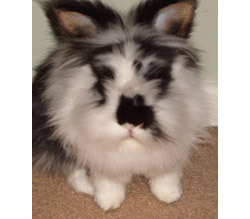 Unlike other wool rabbit breeds, the Lionhead Rabbit has normal fur on the rest of their bodies. Once they reach adulthood they do not require the extensive grooming that some of the other wool breeds do. A highly sociable and relatively a new breed, the LionHead is an attaractive and supprisingly friendly pet. LionHead rabbits are very sweet and docile pets, and love all the petting and attention they seek to obtain.